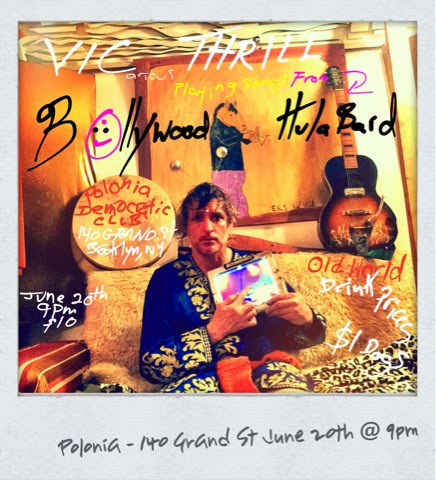 VIC THRILL in an UNPRECEDENTED live performance @ the exclusive POLONIA DEMOCRATIC CLUB, old world beer prices and dollar dogs! Playing songs from his upcoming 72rpm release Bollywood Hula Bard. June 20th 9pm, $10 door charge. 140 Grand St, Brooklyn, NY 11249, from the city take the L train to Bedford Ave and walk against traffic on Bedford until you hit Grand St and hang a right, it's between Bedford & Berry on the left! Then the next day in the Coney Island Mermaid Parade as MerTran, stay tuned and signal me for help if you get marooned!